January 28th, 2016 – Middelharnis, The Netherlands – OPNsense is the only major FreeBSD based open source security & firewall platform with an Open Source Initiative approved license. 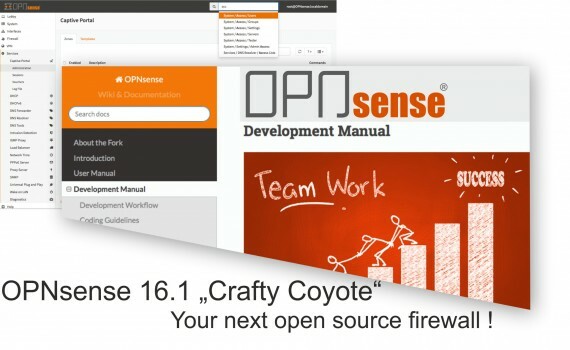 Deciso announces the immediate availability of the “Crafty Coyote” or version 16.1. The latest release extends its already impressive feature set with inline Intrusion Prevention, build-in support for virtual installations and a modular plugin system. For integrators and developers a RESTful API has been made accessible together with updated development documentation. End-users will enjoy the improved menu system as well as the new System Health graphical reporting system. OPNsense 16.1 is equipped with a reliable and secure update mechanism to provide weekly security updates. The latest release is based upon the latest FreeBSD 10.2 release for long-term support.